Management Department was established on the same day as Faculty of Economics and Business (formerly known as Faculty of Economics), which was on 24th Rabi-Ul-Akhir 1410 H, or on 1st March 1981. During its development, Management Department has been accredited A (very good) in 2013 based on the Decree of National Accreditation Board of Higher Education No. 222/SK/BAN-PT/Ak-XVI/5/XI/2013. Since 2010/2011, Management Department has applied Competence-Based Curriculum using student-centered learning approach which contains softskills. At present, Management Department applies Curriculum of Higher Education-Indonesian Qualifications Framework. Therefore, it is highly expected that graduates of Management Department not only have conceptual ability but also excellent skills in communication, leadership, negotiation, self-confidence, and high motivation to get achievements. The history of Accounting Department of Universitas Muhammadiyah Yogyakarta (UMY) is in accordance with the history of Economics and Business Faculty as well as with UMY itself. Economics and business Faculty (used to be Economics Faculty) was established on 24 Rabi’ul Akhir 1410 H, or on 1 March 1981 along with the establishment of UMY. At that time, the department available was only Management. In 1992, initiation of Accounting Department was formulated and 1993 Accounting Department was established with registered status based on the decree of Minister of Education and Culture of Republic Indonesia Number 13110 / DIKTI / Kep. /1993. The department has significant developments as the result of whole-hearted and consistent efforts of UMY academic community. 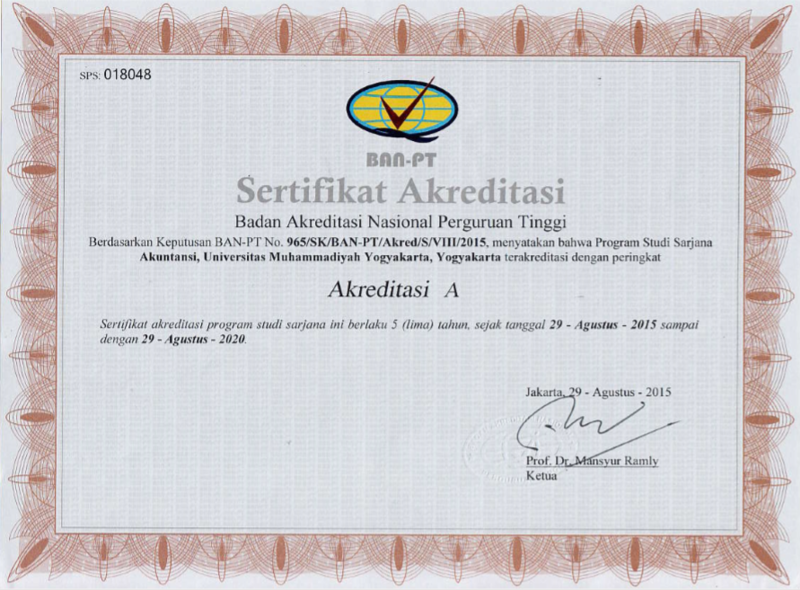 In 2005, it was the first time for Accounting Department of UMY to be accredited “A”. 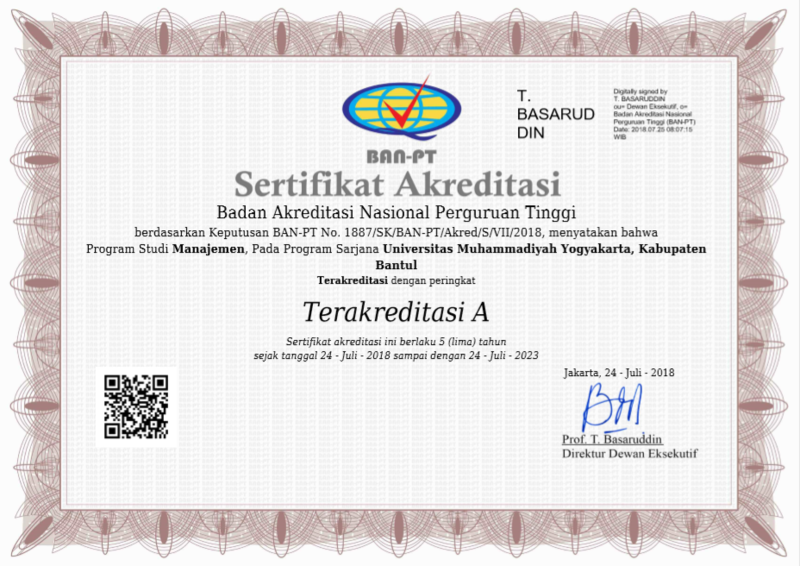 In 2015, based on the decree of National Accreditation Board/ Badan Akreditasi Nasional (BAN) for Higher Education Department of National Education Republic Indonesia No. 965/SK/BAN-PT/Akred/S/VIII/2015, Accounting Department of UMY, once again, granted accredited status with the grade of A which was achieved without visitation or inspection by accreditation assessment team (assessor) of National Accreditation Board for Higher Education (BAN PT) from Ministry of Research, Technology and Higher Education of Republic Indonesia (Kemenristekdikti).